Jenny: All that poetry and all those songs for something that doesn’t last long at all. For a young lady in the 1960’s, options were slim. Girls went to school to learn about Latin and literature but also, and perhaps more importantly, to learn about posture and poise. Educated or not, a lady must be proper first and foremost and able to provide for her man as he sees fit. And if one of these fine girls also happened to show academic promise, then she could push herself as hard as possible to go on to higher learning. Unfortunately, all that would be waiting for her on the other side would be marriage or maybe a teaching job. There is really nothing wrong with either of those options but it does seem an awful lot of work to get there and one wonders why go through all the trouble. 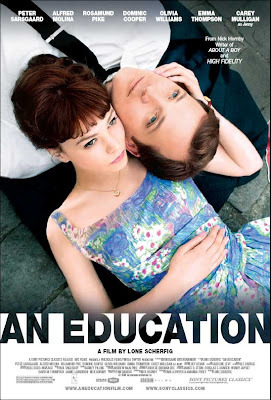 The understated beauty of Lone Scherfig’s AN EDUCATION is how it allows for life to do what it will regardless of chosen paths, schooling its characters and subsequently enlightening its audience. 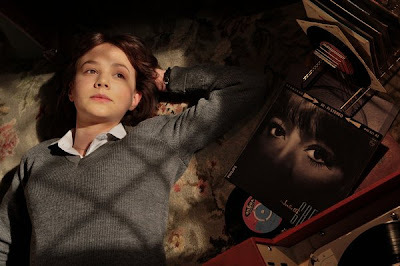 Jenny (Carey Mulligan) is but 16. She is the only girl in her classes who seems to get anything at all and it isn’t long before she starts to see through it all. 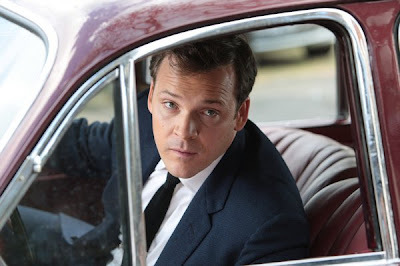 One day, while she waits for a ride in the rain, a strange yet handsome man of nearly twice her age (Peter Sarsgaard) pulls up alongside her to offer her a lift. He is witty and charming and their chemistry is almost instantly perfect. When she accepts his offer, she essentially goes against the number one rule enforced by all parents – never get in a strange man’s car. Naturally, it feels terribly wrong. Given his age, what could he possibly want from this girl? Still, he is dapper and has a wonderful way about himself. Mulligan is boisterous and beautiful in this breakout performance, one that will certainly get her some well deserved notice. And of course, Sarsgaard is easily likable as her suitor, David. Together, they just click and before long, the initial hesitation is set aside so that their love can be given a shot. Natural reticence is part of what makes AN EDUCATION such an engaging experience. Jenny is precious. 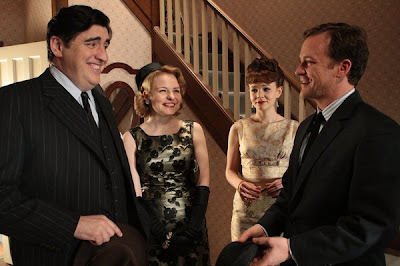 She has great potential and parents (Alfred Molina and Cara Seymour) that, while strict, clearly hold her in the highest regard. And yet still, these educated people allow David to breeze into their home with his dashing good looks and pockets full of money and make them completely ignore his age and his intentions for their daughter. Her father will not allow her to enjoy anything on her own that doesn’t directly enhance her scholastic education but when a handsome man comes knocking, it would seem that marrying his daughter off, especially to someone so well to do, is a lot more affordable than sending her to Oxford. At the same time, Jenny is completely taken with the life of fancy that David offers and begins to see how being taken care of can be a lot easier than taking care of yourself. Nick Hornby’s elegant screenplay poses a very familiar dilemma to the audience. What is more valuable – a formal and well rounded education in a class room or the kind of learning that only comes when experiencing life outside of the classroom? What makes this simple question so complex in AN EDUCATION is that it constantly forces you to reevaluate where you stand on the subject, subsequently reminding you that nothing is as simple as you think when love is involved. I learned a thing or two myself while I sat back and absorbed this masterful picture. The main lesson? AN EDUCATION, both the film and the arduous right of passage, are both well worth the time. How many sheep would you give An Education?